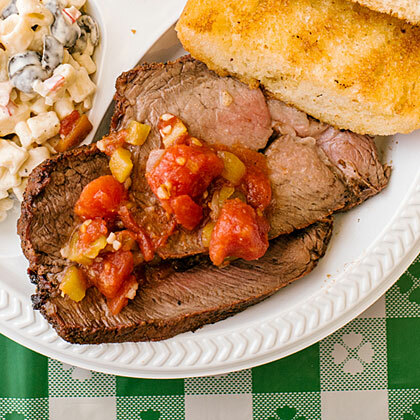 The pit crew at the Santa Maria Elks Lodge prefer top sirloin to tri-tip for its rich flavor, juiciness, and tenderness. Cuts of top sirloin (also called top block) usually weigh 10 to 15 pounds, so unless you're feeding a crowd, freeze half for later. At home, most Santa Marians slice the meat into thick steaks to cook on a backyard-style Santa Maria grill (santamariagrills.com). Your gas or charcoal grill will work too. For the signature red oak flavor, order logs from santamariagrills.com or chips from susieqbrand.com. Slice the piece of top sirloin lengthwise, down through the top of the meat, into 2 pieces, each about 2 in. wide. Trim away all but 1/4 in. fat (set trimmings aside). Mix salt, pepper, and garlic salt, then sprinkle pieces generously with it. Let meat sit 1 hour at room temperature. Meanwhile, if cooking over wood, build a tipi-style fire (see sunset.com/buildfire for pointers if you need them) and let burn to ashy chunks and low flames, at least 45 minutes. Spread chunks into a thick, even bed and, if you're not using red oak wood, sprinkle red oak chips onto logs. If using gas, prepare grill for indirect medium-high heat (about 400°), and put drained chips in a small aluminum pan directly on a lit burner (or in your grill's smoker box). If using charcoal, prepare grill for indirect medium-high heat and sprinkle chips directly on coals. When chips start smoking, you're ready to cook. Oil cooking grate with a wad of oiled paper towels and, if using a Santa Maria barbecue, crank to about 5 in. above flames. Lay meat and pieces of trimmed fat on grill, turning every 15 minutes or so and lowering screen as fire declines, until meat is a rich medium brown all over and an instant-read thermometer registers 125° to 130° for rare, 35 minutes to 1 hour. When turning meat the first time, top with some grilled fat to baste the meat as it cooks, and replace it every time you turn the meat. On charcoal or gas, cook meat with fat over indirect heat, covered; during last 5 minutes, move over direct heat and brown on both sides. Transfer to a board and let rest 10 minutes. Slice meat 1/2 in. thick across the grain and serve hot. *Order ahead from your butcher--unless you live along California's Central Coast, where it's easier to find.